London may be one of the world’s preeminent conurbations, but in addition to the plethora of people, traffic, skyscrapers and other big-city prerequisites, it also has an abundance of parks. From Clapham and Wandsworth Commons, to Hampstead Heath and Hyde Park, London performs pretty well on the public-space front. Indeed, a quick stroll around any of the aforementioned spaces, and you’ll see two prominent features permeating all of them: joggers and dog-walkers. And it’s at this point, we introduce you to a startup that’s seeking to tap into this trend across the UK and into Europe. Brendan Fahey is the founder and CEO of Jogs for Dogs (JFD) a company he launched after completing his degree in Seattle back in 2007. This revamp will see the site take on a more global focus, and Brendan says there are a few quirks and adjustments needed to make the site more UK-friendly. Plans are currently underway to bring an increased presence to continental Europe too, which will include multi-language functionality, and different search parameters for connecting dog-owners with runners. It’s a pretty straight forward platform to use. You sign up at JogsForDogs.com, and you either register as a dog-owner or a dog-runner. You can also register directly using your Facebook credentials with a single click. Here’s a typical profile for a dog -runner. Their information is listed down the right, and they can post status updates and pictures in the middle pane. Owners and runners can search for each other on the search page, which Brendan says he wants to tweak for the UK-centric version of JFD. Users are then directed to a list that meets the search criteria. Here, they can see a basic summary and can select the runner they’re interested in to see their complete profile. Once a user clicks on a profile they see the runner’s detailed profile. If they sound like a good match for their mutt, they send a message and can add them as a Friend. After each run, runners are encouraged to fill out a PJS (Post-Jog Summary) that is automatically sent to the owner so they can see how the run went. Jogs for Dogs is certainly an interesting initiative, but how does it work from a financial perspective? Who gets paid what and when? So, for example, they decide what days and times the runs will take place, how much it will cost, and other details. “We are currently working a payment process into the site so runners can do all of their billing and tracking through the website, and mobile app,” adds Brendan. In terms of what’s in it for Brendan and Co., they’re privately funded and their revenue model is entirely ad-based at this point, meaning they don’t take a cut of the dog-owners’ money. Membership of the site is completely free. 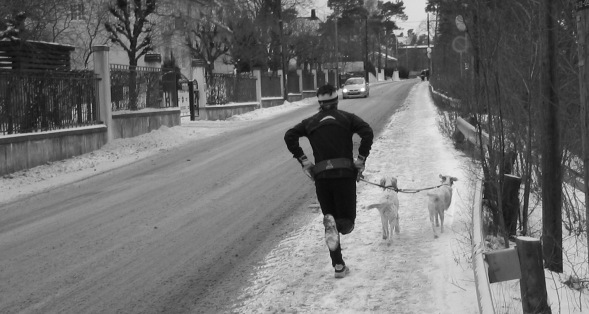 “We had initially tinkered with making it a subscription service, where runners pay to be on the site, but we decided the best way to get lots of dogs out running was by making it free for everyone,” says Brendan. Brendan also tells us that there are runners on the site who go to school, say, in Seattle, but during breaks they head home to Boston. With just a few clicks they can change their location and make a few extra bucks, and burn off some holiday calories while they are home.